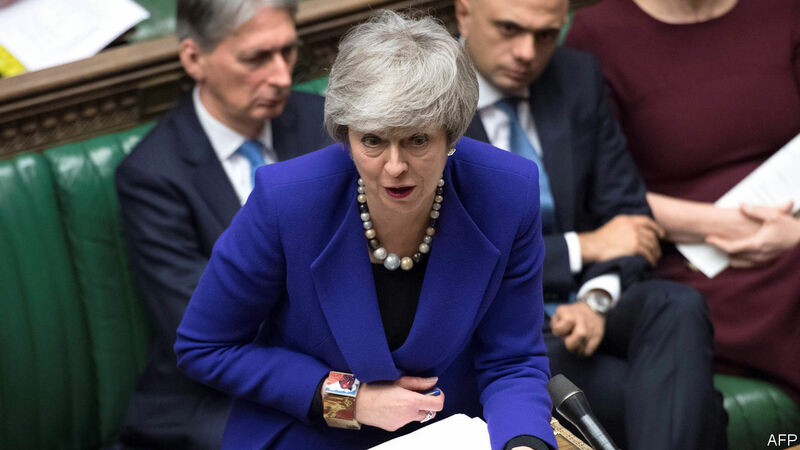 THERESA MAY has become so used to losing votes in the House of Commons that when, on January 29th, the prime minister got MPs to back her on a motion regarding her Brexit deal, it was treated as a breakthrough. “She did it!” announced one front page the next morning. Another hailed “Theresa’s triumph”. Alas, it is anything but. MPs agreed that they would support the exit deal she has agreed to with the European Union, so long as the Irish “backstop” was removed (see article). But on the crucial question of what might replace it—something that negotiators in Brussels have spent almost two years scratching their heads over—the motion suggested no more than unspecified “alternative arrangements”. Mrs May vowed to take this vague demand to have her cake and eat it back to Brussels. She will get short shrift, and she deserves it. A sensible approach to the Brexit talks would have been to agree at home on what kind of deal to go for, then begin negotiations. The prime minister did the opposite, talking to the EU for nearly two years before coming back to find that her treaty could not pass her own Parliament. With less than two months before Brexit day, she now proposes to reopen negotiations on what she herself recently insisted was “the only possible deal”. It is abject. But any exasperated European leaders who are keen for Britain to just go, deal or no deal, should think again. A chaotic exit with no withdrawal agreement would represent a colossal failure by both sides. The EU cannot solve Westminster’s tumultuous politics, let alone the contradictions within the Brexit project. But one thing Britain urgently needs in order to sort out its mess is time—and that is where the EU can help. Those Brexiteers urging the EU to make “concessions” on the Irish backstop misunderstand its purpose. Britain wants an independent trade policy, an invisible border with Ireland and no customs checks between Northern Ireland and the British mainland. These three aims are incompatible. If Britain sets its own tariffs, it will mean customs checks on goods passing between it and the EU, of which Ireland is a member. That means inspections at the border. Britain believes that in future it will be possible to do such checks remotely, perhaps using new technology. One day that may be true. Until then, an interim solution is needed. This is the backstop, under which Britain would remain in a customs union with the EU, keeping both borders open but delaying its ability to strike trade deals. The backstop thus exists as a logical consequence of Britain’s own negotiating objectives, not European caprice. By definition, it expires when someone comes up with a way to carry out customs checks with no border infrastructure. Hardline Brexiteers’ calls for the backstop to be time-limited are thus not just unrealistic but nonsensical. Beyond more words of reassurance about the arrangement’s temporary nature—which it should ladle on liberally—the EU cannot do much about the backstop. Where it can make a difference is on the timing. Unless Parliament agrees on a deal by March 29th, Britain will fall out of the EU without any exit arrangements in place. Britain itself would suffer most from this. But for the EU, and especially Ireland, it would also be horribly damaging to lose one of its most important members in such circumstances. Parliament this week made clear that it was against leaving with no deal. If Mrs May wants to avoid this fate, she will surely have to ask for more time. The EU should signal that it will agree to her request. The longer Britain has to sort out its mess, the more chance that it can avoid disaster. Mrs May’s strategy has been to get the hardline Brexiteers in her Conservative Party to back the deal. The vote this week for the cake-based motion, which more or less united Conservative MPs, has helped feed the idea that this is still possible. But the response from Brussels ought to put paid to that thinking. In reality, Mrs May is likely to have more luck winning votes from the opposition. The price of Labour’s support seems to be a permanent customs union. The backstop, as Brexiteers complain, already amounts to something close to this. It is possible to imagine a deal being done, but not in the two months remaining. With more time, Parliament may yet feel its way to a solution. Brexit is a British problem that only Britain can fix. But the EU can give it the time it needs—and it must.